(CNN) - Republican presidential candidate Herman Cain said it would be "great" to impeach the president, but that the Democratic controlled Senate would prevent such action. On a conference call with bloggers Tuesday night, the former Godfather's Pizza CEO called the health care law and the Obama administration's stance over the Defense of Marriage Act impeachable offenses. The news was first reported by POLITICO and later confirmed to CNN by the Cain campaign. "There are a number of things where a case could be made in order to impeach him, but because Republicans do not control the United States Senate, they would never allow it to get off the ground," Cain said on the call. "The president is supposed to uphold the laws of this nation … and to tell the Department of Justice not to uphold the Defense of Marriage Act is a breach of his oath." Cain is wrong. It would be better if he is voted out of office. Period. Cain is smart. He knows that he won't win. Cain is only running for president because he knows that being a candidate will bring prestige to his future business endeavors such as book deals, etc. SHOCKER... A candidate calling for the current president's impeachment. I think Godfathers Pizza was originally called "Daddy Green's Pizza" wan't it. Just direct-a your feets-a to Daddy Green's Pizza! Sad, sad, sad... impeachment is to be used as a last resort and not to further rather narrow political agendas of any party. Anyone seeking the office of President should be more measured in their calls to take extraordinary steps. Cain's call is a clear indication that he is not qualified to hold the office he seeks. I guess this marginal "candidate" realizes his campaign is going nowhere and people are paying him less attention with each passing week. I'm sure he knows (actually, he may not know) that health care reform was passed by Congress and that the Justice Department and Solicitor General have discretion as to how they allocate resources. Perhaps Cain should try to find a single GOP House member willing to propose Articles of Impeachment (and a House majority ready to approve same) before he "blames" the Dem-controlled Senate for the lack of impeachment. Cain is an even-more-undesired Pawlenty who is still hanging on because he has personal $$ that allows it and nothing else to do. Even his own party ignores him. What is it with these people? We have very, very serious issues to resolve and he talks this crap? I'm sure that Cain's popularity rating, like those of Bachmann and Palin, rate very high with single-celled animals. This guy's getting paid by some rich Republican organization to run for the Republican nomination so that they can point to him and say "See, we're really not racsists". He has no chance of becoming their nominee, so what other explanation is there? Poor Cain. A highly ambitious unqualified black man who never held elected office of import in a party that will never nominate a black man for President. Now, that is audacity! This guy doesn't have a clue. I live in a conservative rural area and know a few tea party types. I've had to listen to them rant and rage. They don't want a Obama or ANY minority as president. Must have needed some attention - they always say or do really outrageous things to get their names in the media and then complain about the media. Media always reports on the absurd - never the good, logical, or honorable things. The guy must be pushing a book or CDs or something and needs to name recognition. I find him repulsive to look at and listen to. Not a good speaker and definitely no visual appeal. Cain along with GOP field are a joke to be honest. Sorry – this upcoming election cycle will not see a chage in my alignment. If they have a solution I was willing to hear it but since they spend so much time fighting they lost my vote. Work for the citizens and not against them. Let's face it...how much has he been in the news lately? He's just looking for a headline. The President always has the option of not pushing in favor of a federal case. And this law is discriminatory against a specific segment of American citizens, much like the Jim Crow laws he fought to overcome. What a hipocrite! @Jeremy – there use to be 5 or 6 Godfather's Pizza places in my home town, now there are only 7 in the entire state of Washington...I just checked their website...Nice job as CEO Mr. Cain. You asked what have I done as a liberal...I've saved lives, kept people from killing themselves or others, helped them rebuild their lives, helped them find jobs despite a disability and earn a living wage, I've helped people that have been laid off during this recession get back to school and get retrained so they can get a job and support their family. That is what this LIBERAL does and is DAMN PROUD OF IT! What have you done that is so cool? Made some money and kept if for yourself? I'm going to call this for what it is. Cain's statement is nothing more than a political tactic to gain the votes and the overwhelming backing of the GOP base. His arguement holds no grounds. There are countless examples of impeachable offenses from the previous Republican administration. The nation was put into debt by fighting to needless wars (Iraq and Afghanistan)- not to mention countless lives were lost (many in the age range of 20-40). The previous administration issued the first stimulus or bailout. Cain has no idea what he is talking about, nor a hint of the position he is seeking to operate in. Please do us all a favor and impeach yourself from the nomination process. Can Cain be disavowed? He has not idea what he is talking about. Maybe he shoud refer to the Book US Goverment for Dummies to learn how things work. Saying and doing are very different things. Saying stuff without really understanding what is being said is stupid. Yeh, kind of ridiculous. Even most of us (normal) right-wingers would say this is going too far... at least those of us that don't troll and trash talk all day. Every Godfathers pizza in my area closed years ago. That hardly makes his argument that his CEO experience can create jobs convincing to me. Who gave this fool a microphone? If anyone should have been impeached, it should have been bush...increasing the debt 40%...wow. So any change in social policy at all is an impeachable offense? Well, better dig up every president who ever lived, then. At any rate, we can all breathe a sigh of relief. Now that this blowhard has used up his fifteen seconds of fame (because who can afford fifteen minutes anymore? We have a lot of jokers waiting in line), we don't have to hear about him anymore. 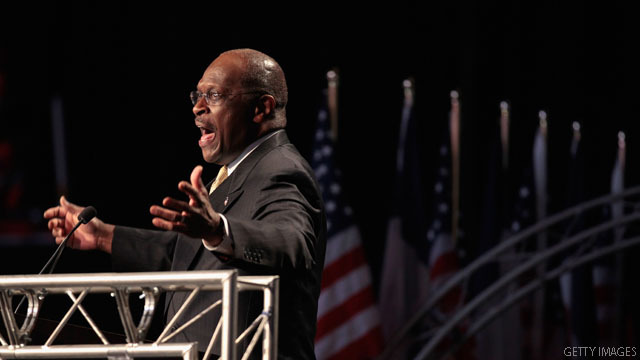 Herman Cain is a disgrace and is being used by the GOP like a rug. To all voters: If you think the country is in bad shape now, if the Republicans/Tea Party manages to get to the White House , you will really know what Hell on Earth is. Every voter in the US should use their wisdom and judgement in selecting th President of the United States. You will not be able to do this unless you are educated on the true facts that we are facing as a nation. Barack Obama is not perfect, but he has the interest of all the people and is trying hard to move this country forward. The GOP/Tea Party has only the interest of pleasing the wealthy. Ask yourself the Question: What do they mean, when they say: "Take our Country Back". Who do you think they are trying to take it back from? Absurd. If ever a president should have been impeached it was Bush on starting an unfunded war based on lies to the American people. Preventing the ramming of Republican social issues down the throats of all Americans is not grounds for impeachment. Gay marriage doesn't in any way degrade my 45 year heterosexual marriage. Why don't people understand that gays in fully committed relationships are actually good for our society?